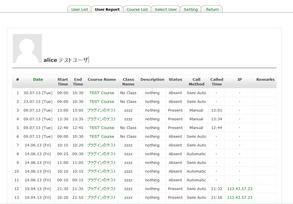 homeroom module displays attendances of all the courses. This is dangerous depending on usage. So, only manager and admin can add instance of this module. When you use this module, I recommend that you create a new course for exclusive use. Specify the beginning month of the semester of your school. Default is September. Please select Attendance Plugin. You can select AutoAttend (block_autoatttend) of Attendance (mod_autoattendance). Default is AutoAttend. You can select displied name pattern in this module. If you check off this, links to the Feedback are not displayed.